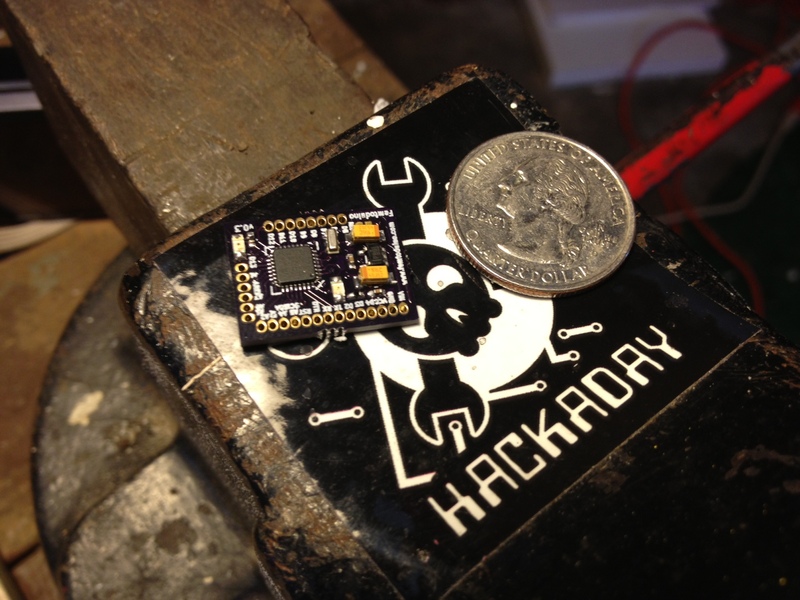 We originally heard about the FemtoDuino last year. It looked good enough and tiny enough, but we didn’t really have a need for it. Recently though, we started on a new project (which you can follow on the forums!) which required an easy modification to an existing circuit. Space and weight were quite important so we decided to pick up a couple femtoduinos at $25 each, and give them a try. These things are tiny. Their foot print is 20.7×15.2mm. You can see in the picture below, with a quarter for reference. Tiny. Frankly, there’s not much to say about them. They’re an Atmega328 that is arduino compatible. I plan on using my redbull Arduino to program this thing, since you need to bring your own serial interface. If you’re anything like me, you have atrociously sloppy soldering and shaky shaky hands. I was a bit concerned about actually getting those wires soldered in without bridging the pads. I was able to pull it off though. Here’s a video so you can see how horrible my soldering technique and equipment are. I really don’t have any complaints about this thing, it works just like an arduino but smaller. The closest thing to a complaint is that the silk screening is a bit blurry making it difficult to read which pins are what. It isn’t horrible, but it isn’t perfect either. We really couldn’t think of much else so we decided a haiku would cover it. Of course, if you want to follow along and see if I end up with complaints, you can watch me build these battling star wars themed R/C cars. and a proper vise… aligator clips on pcb ewwwww. no wonder every smd solder job appears on HAD this guys don’t even have the basic material to do even pth soldering. i KNOW! Yeah, I klutz my way through it ok.
With that soldering iron it’s not your fault your soldering is terrible. Seriously. I got a $30 hakko 15w iron that isn’t temp controller or anything, and it’s was much better than the ratshack garbage. I used that to do 0603 stuff. But even that isn’t all that great in the long run. I would highly recommend an aoyue 937+. It’s only $58, and it’s a digital temp controller iron. I’ve been using mine for a couple years now, I absolutely love it. When I was doing a lot of board population soldering for someone I found that blu-tack is an excellent tool for holding the boards in place as they will stay put but you can quickly & easily move them about the desk without having to undo vice jaws. Just don’t get blu-tack too hot or it goes extremely stringy & sticky which can make it difficult to remove from inbetween IC legs. If you need to use alligator clips, put a thin sheet of styrene or cardstock on the board so the clip teeth don’t scratch the board. And look at the solder used. Last time I saw solder that thick it was used by a roofer! Seriously, go for the thinnest rosin core solder you can buy. You will never look back. What really bothered me was the way the tip moved in the “socket.” Agghhh. Years ago, after going through many cheap irons, I finally bought a temperature controlled soldering station. What an amazing piece of equipment. It’s difficult to explain just how wonderful it is to have proper tools. I’ll be interested to see how the Femtoduino works out, as I’ve been considering it for a project. You might want to obtain a more delicate and temperature-controlled soldering iron for future work. That thing looks more suited to copper plumbing. I have a bigger nastier one too, but it is 100w for stained glass. Yes, this small Board is excellent for nano copter. I love the highly uneduated people here that don’t understand real costs of making something in a short run. why not use the teensyduino? the teensy is nearly 4x the size. I wanted to give this a try. I left my last teensy halfway across the country a few weeks ago. 1. A built-in USB port, so no FTDI cable or Arduino needed for programming. 2. Normal 0.1″ connectors, so standard header pins can be used, and soldering is much easier. 3. Ability to act as an HID USB device (keyboard, mouse). 4. Much more reasonably priced: $16 (w/o pins) + $3.80 shipping for up to 2 pieces. I love the teensy. I just left my last one in california on a trip. I wanted to try this one out for fun. 3. Good point… but at the size it’s at, there’s not much room for anything else. Wow. We should have caught that. For less than the cost of two overpriced micro’s! While you’re at it get two so you can do SMT. If you don’t heat both sides of a ceramic cap/resistor then it isn’t right. 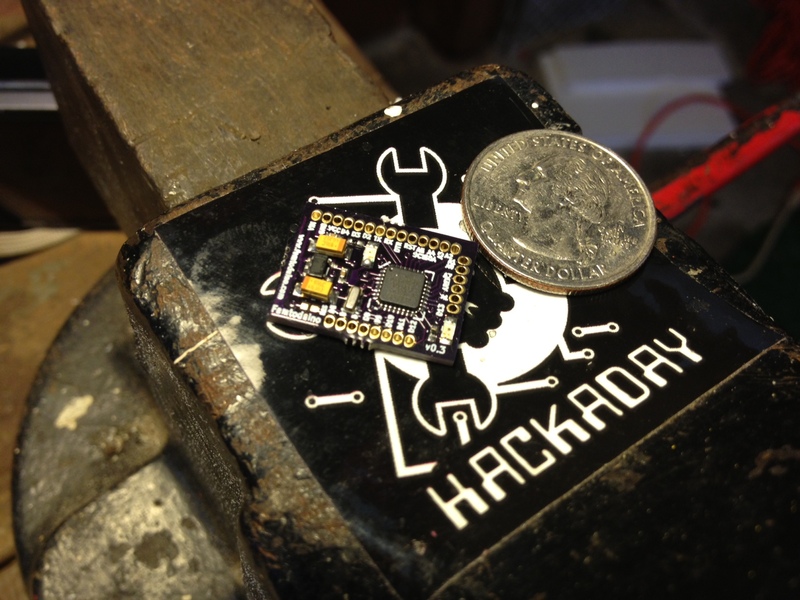 Nothing wrong with doing tack and reflow for SMD components. That’s what your hot tweesers are for. Two soldering irons? How caveman esque..
tweezers are expensive! I learned chopsticks style and even after using tweezers I kind of prefer it on a lot of parts. May I suggest using soldering flux? I hand solder most of the board (including the ATMega328p-mu), but that’s only possible due to generous amounts of flux. It keeps the solder from sticking everywhere. Or use good solder wire. I prefer Multicore Crystal 511. It’s got excellent wetting capabilities, and flows very nicely, even on somewhat dirty or corroded surfaces. Because of the halide additive, I recommend cleaning up the residue. For 99% of SMT work, I don’t use extra flux. Is there a spec sheet somewhere? What voltages does this run on? So this is what? ATmega’s breakout board+bonus parts for insane price? Buying this has nothing with hacking. Was just going to say that, this is a simple break out board with a crystal and an LDO, it’s components for maybe $5 in volume, including board. I made a few similar boards to use for throwaway applications where i needed a simple AVR, they’re great but not worth $25. But it can be used in a hack! US$ 25 is good ..
RMB 25 … that will be GREAT !! Try the alertnative that’s 5 bucks cheaper and offers compatability with existing arduino shields. Try something that doesn’t exist for purchase yet? Sweet! what time machine are you using to go into the future to buy those? Those look really cool! it also looks like $35 once you get the shield and usb board so you can use it. What? has Pico-duino already been used? but I would expect something with the femto prefix to be a LOT smaller than something with a pico prefix. it is a lot smaller. like less than 1/4 the size I think. Also, the page for the picoduino is gone. Buy these. Don’t even question it, just buy ’em. Never get made fun of your soldering iron again… At least not from people who aren’t just attached to brand names. This is the best iron for the price and that tip makes it just as good as anything else. Anybody who tells you anything different is just throwing out names like they mean anything other than you get a fancy box with a fancy set of instructions in it. I have shaky hands as well. What really helps is to rest your elbow on a pillow that is soft enough to tilt up and down easily while still providing a little support. Doesn’t eliminate the shakes entirely, but dampens it enough to do some pinpoint work.